It appears that we are headed for an unusually long period of warm and dry weather. Unusual because it’s rare to have a solid week or more in early May with temps in the 75-85 degree range, and mostly sunny or sunny skies. There is no rain in sight…at least not through the middle of NEXT week. Every month so far this year has been drier than average, and April ended up a little drier than normal too. I had 3 days off and during that time it was interesting to see how the maps changed…more of the same progression we’ve seen in the models the past few weeks. Specifically, an upper-level ridge is forecast to build more directly over the West Coast but then ends up back in its favored position a ways offshore. This leads to a very warm 7 Day forecast and then we have to back off a bit. 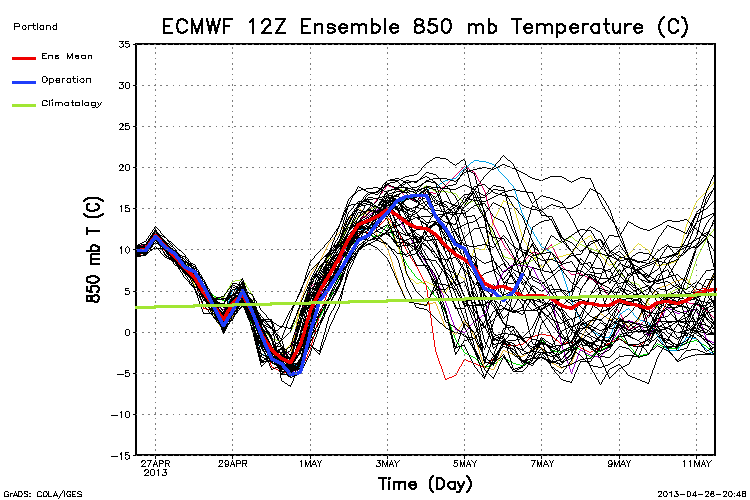 Last Thursday and Friday both the GFS and ECMWF were showing 850mb temps (celsius temp near 5,000′) up around +14 to +17 for tomorrow (Wednesday) afternoon. Instead it’s going to be around +5 to +7. That’s a huge change. In the end (for the rest of this week) it won’t matter to the average person because the ridge is still close enough to give us weak offshore low-level flow and warm sunshine. notice the time goes from right to left, so the right side of the chart is Sunday morning and the left side is Wednesday morning. 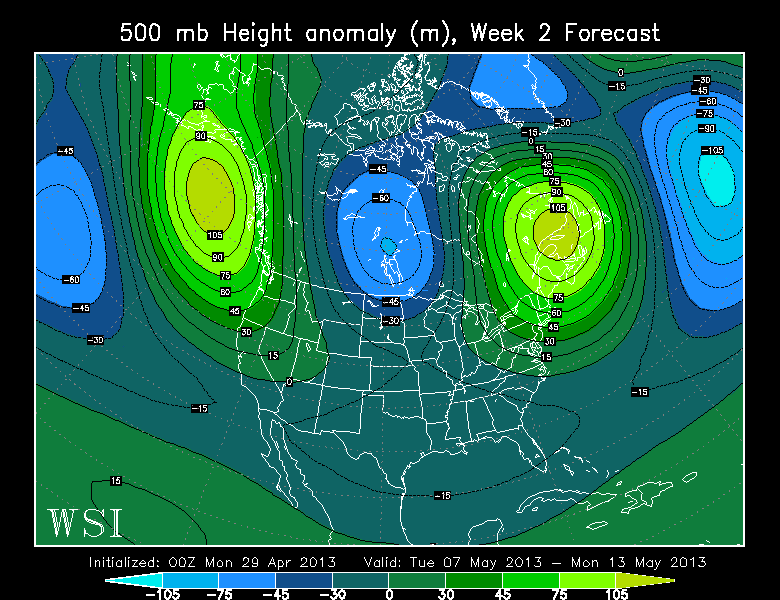 Either way, one thing is certain, our drier than normal spring weather is going to continue. For you gardeners, it’ll be time to start watering this weekend, especially those new plants you’ve put in. Enjoy the sunshine! I had the weekend and Monday off for some kid’s events so a bit delinquent on posting. So I’m back in the saddle and looking carefully at the weather maps/models…I’ll post a few thoughts later. I have some other office issues and a project I need to get done. Fresh podcast just posted this afternoon…enjoy! 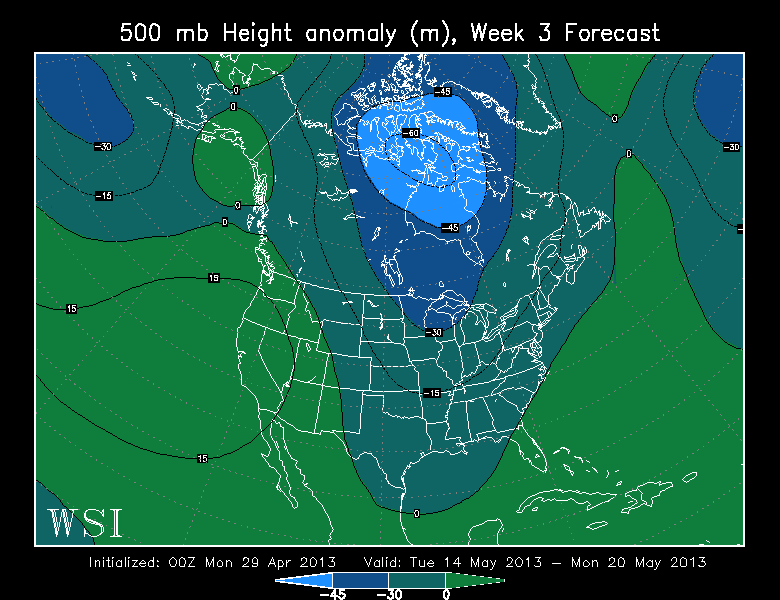 This week, the guys talk mountain snow pack and what areas could see drought conditions this summer. Plus, they’ll answer your weather questions and break down our Cities of the Week! Mark and Brian will also take you behind the scenes of the new set of weather promos. Take a look at one of our newest spots. Salem hit 81 degrees this Friday afternoon; making it the warmest day so far this spring. 80 degree highs were also recorded at McMinnville and Aurora. 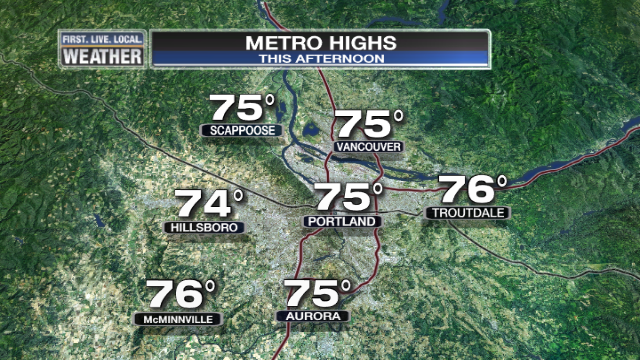 Here in Portland we topped out at 78 degrees, once again the warmest day so far this season. The decent, dare I say “nice”, forecast for the weekend continues. Sure, it’ll drop 10-15 degrees from today over the course of the weekend, but it’s a huge improvement over the cool and showery weather we’ve seen each weekend this month. We might see a sprinkle late Saturday night or early Sunday morning as a weak system drags across the area, but the main chance for rain is 24 hours later. That will be Sunday night and early Monday morning. 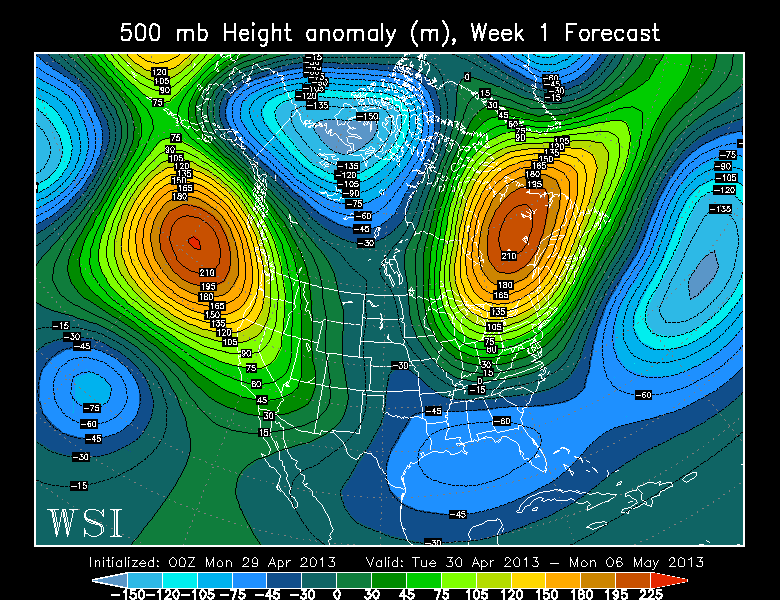 The forecast keeps looking warmer; models today have speeded up the departure of the cool trough early next week. We are already getting warmer north-northeast flow by Tuesday afternoon if they are correct. 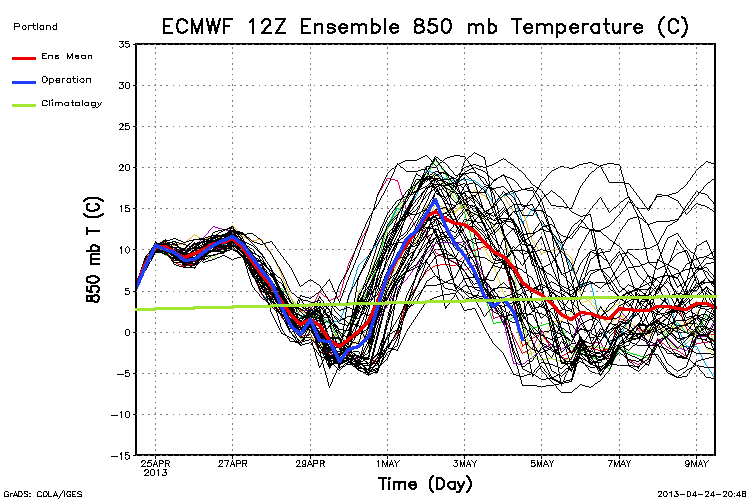 Both the 12z/18z GFS and the 12z ECMWF show 850 mb temps in the +12 to +14 range next Wednesday afternoon and +14 to +16 range Thursday. 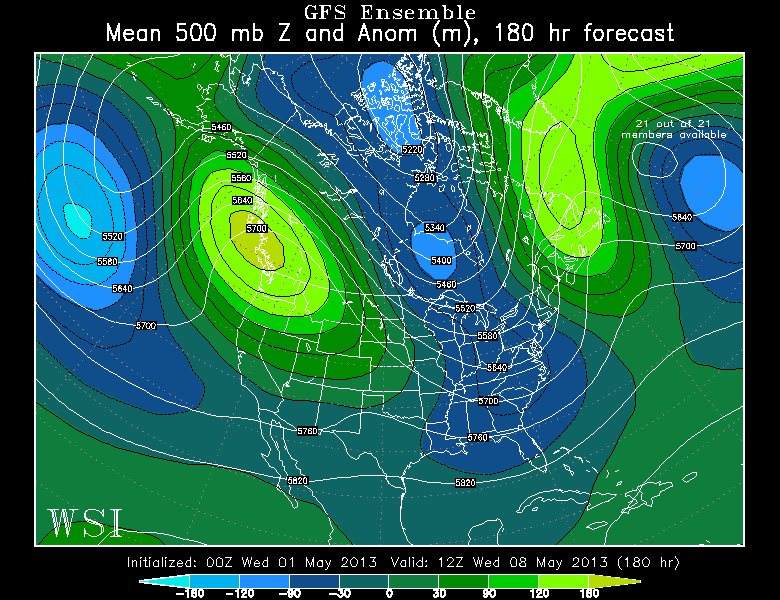 That’s with a thermal trough west of the Cascades and easterly low level flow. 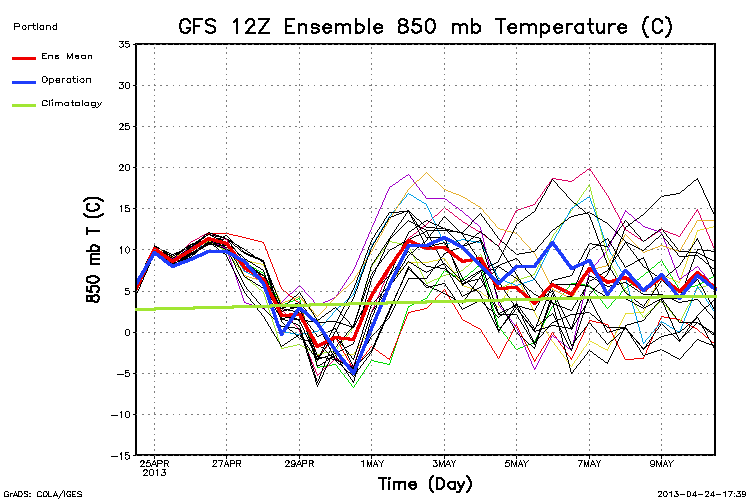 According to my chart for April that would give us 80/83 degree highs for PDX Wed/Thur. 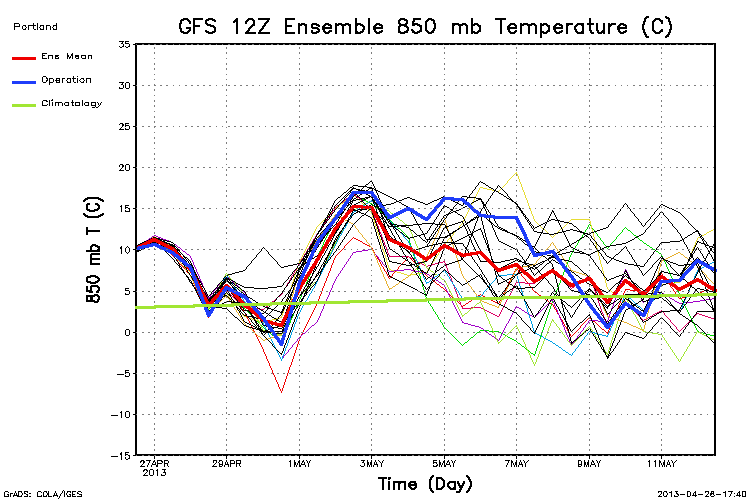 The chart for May is warmer: 82/87. So I stayed a little on the low end going for 80/83 on the 7 Day forecast. 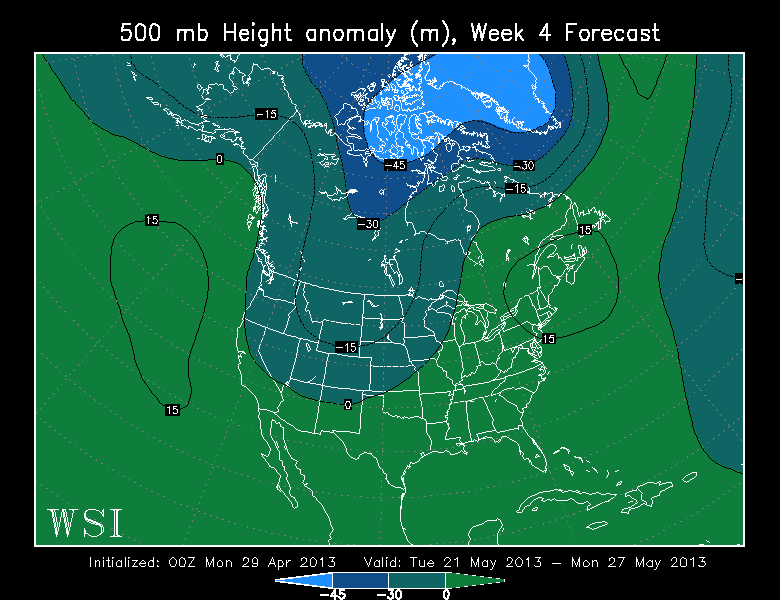 I see by the end of next week it’ll either be -5 or +21…extremely low confidence on any one solution. same thing, but not as extreme. Forecast Keeps Getting Warmer; Maybe 80 Friday? Remember last week when we had to back off the 80 degree forecast for today? Lots of complaints that the forecast is “always” doing that. Well in the case of this week we’re going back the other way, so the forecast CAN get warmer. Why? 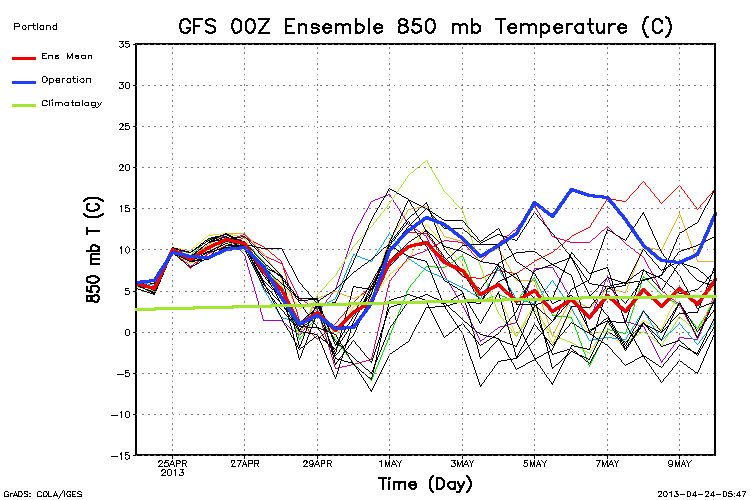 Models have backed off and slowed down the cold weekend trough approaching and that prolongs our little warm spell. Upper level heights actually rise (instead of falling) the next two days and temperatures warm in the atmosphere as a result. The 12z and 18z NAM both show 2-4 degrees surface temp warming total through Friday. 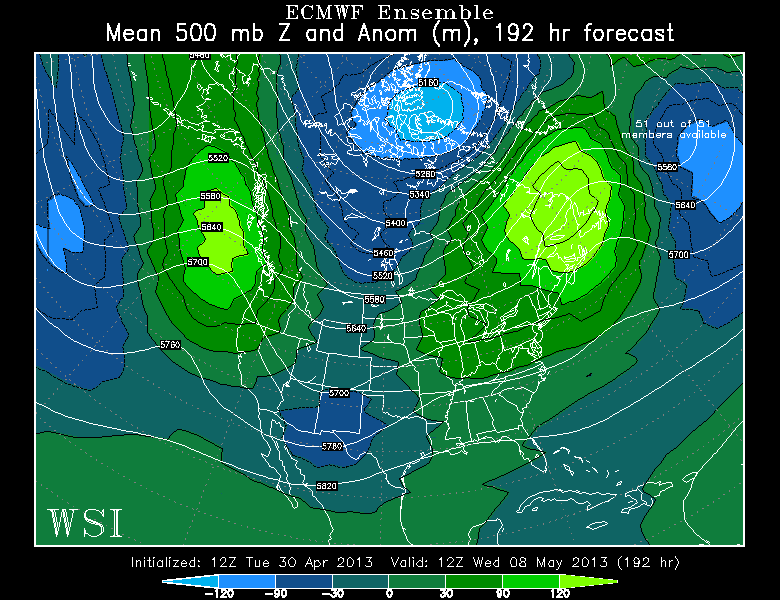 The GFS is similar. That would put us around 77-80 degrees by Friday. Maybe I have a cool bias and should have gone with that 80 after all? Just a couple of days later instead. 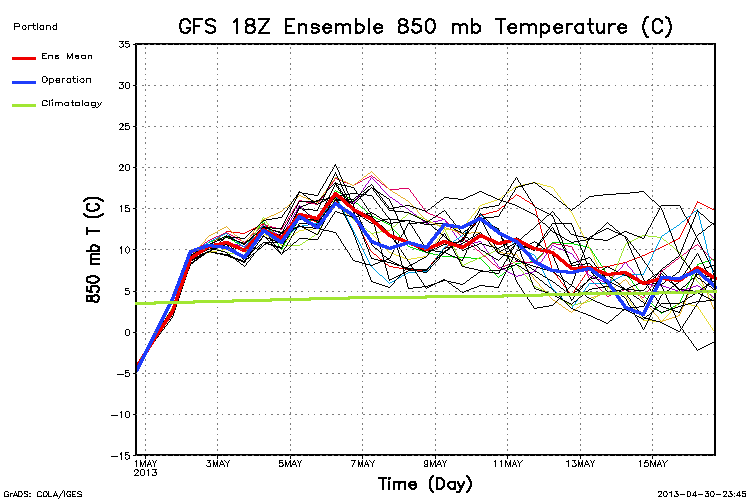 The 12z WRF-GFS says we hit 80 Friday here in Portland. 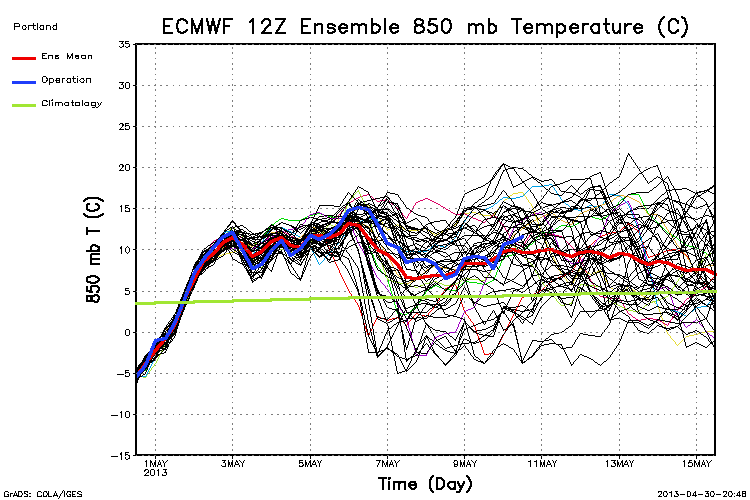 The ensemble charts sure say spring! Warm to cool Sunday/Monday then back to above average. Burns was 13 degrees and Baker City was 12, both records for the date. 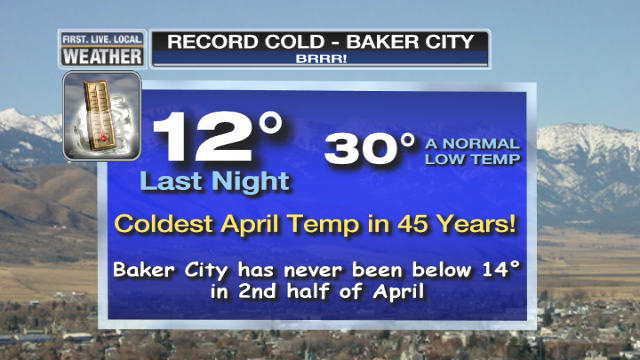 As you see below, Baker City hasn't seen a 12 degree temp in the 2nd half of April since the airport records began in the early 1940s! Coming up…for those of you who think the 7 Day forecast never actually improves with time but most likely goes downhill? Not this time; it appears Thursday and Friday we’ll see temps stay in the mid 70s. The 00z WRF-GFS even tries to get us close to 80 on Friday…we’ll see. So we may end up with 5 days of straight sunshine for this workweek! 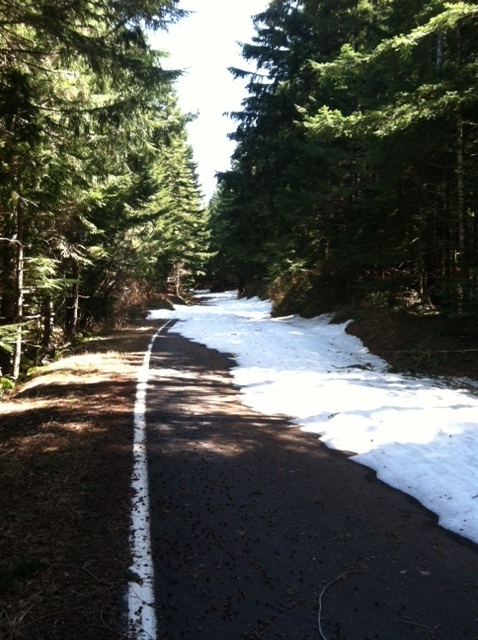 The snow line has retreated in the past two weeks on the west slopes of the Cascades. I rode my bike up there in the bright sunshine this morning; just perfect with temps in the 50s, 1 vehicle and 1 bicycle passing me in one hour and 30 minutes! Three weeks ago I ran into solid snow right after the snow gate. Today I made it almost all the way to the “big corner” (where the road suddenly swings hard to the right in a switchback with a guardrail) with just a few thin patches of snow. But there was a solid area of snow just in front of that corner; so basically the road is passable up to 3,000′. This is where I stopped since I wasn’t in the mood for wet feet again, and this job thing gets in the way of personal afternoon recreation too. It’s great cycling with no cars beyond the snow gate; sometimes I get really crazy and ride on the wrong side of the road. I know…real wild. A perfect day today and we have several more to go. We just made the fresh 7 Day forecast and you’ll notice it’s a bit warmer Thursday-Friday. It appears that lowering surface pressure to the north keeps us from getting a strong onshore push those two days, so minimal low clouds and a warm atmosphere continues overhead. That snow patch in the pic above will definitely be getting smaller. For tomorrow, the weak offshore flow returns. 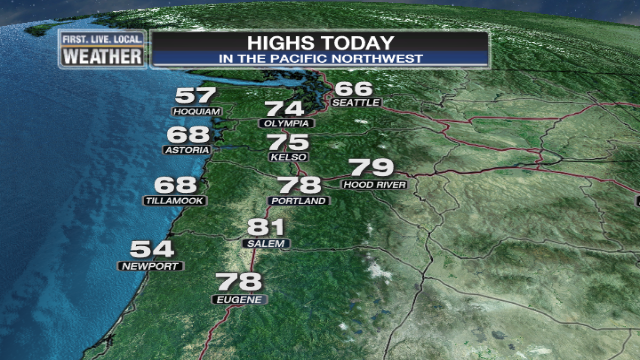 Combine that with a little warmer air mass overhead and we should pop temps up 4-7 degrees over today’s highs. So we stayed with a 75 degree forecast. You are currently browsing the FOX 12 Weather Blog blog archives for April, 2013.